The Boss GT Pro is more than just a guitar effects processor — in fact, with its dual COSM-based processing engines, it's two. But when it comes to guitar tone, does the GT Pro put Boss in charge? For a number of generations of guitar players, Roland's Boss brand has been synonymous with stomp-box effects pedals, and the range has included some absolute classics of their kind. However, the Boss product line has also included some serious guitar-based multi-effects processors. For a good number of years these products have been based upon Roland's COSM (Composite Object Sound Modelling) technology which, amongst other things, provides the required amp and cabinet modelling. While the majority of the Boss guitar multi-effects processors have been floor-mounted units (such as the ME33 and GT3 reviewed in SOS in recent years), the GT Pro is a rack unit. Like most modern multi-effects processors, this new box comes with a feature list as long as the average guitar lead, but top of the list here would be the comprehensive input/output options, USB connectivity and dual COSM processing. The latter means that you can create a patch that includes two completely independent amp/cabinet models. As described later, this makes it possible to produce some huge guitar tones. That said, the GT Pro also comes with a fairly hefty price tag — so is it a price worth paying? The GT Pro is housed in a smart 2U rackmount and, given a suitable case, ought to stand up well to the rigours of both studio and live use. Both the front and back panels are fully stocked. The front-panel controls are split into a number of logical groups, on the far left being the input and output controls, including a guitar jack input (usefully duplicated on the rear panel, although the front-panel socket takes precedence) and a headphone output. Centre-left is dominated by the display, a large rotary knob for patch selection or parameter adjustment and a set of extremely 'amp-like' tone and presence controls. The mass of buttons to the right of the display deals with all the effects options and provides access to the unit's various system settings. 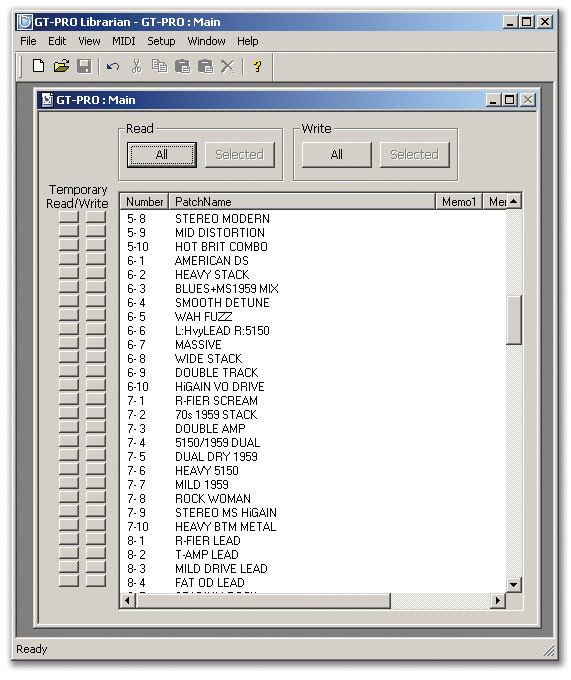 The main window of the GT Pro Editor software is busy but easy to navigate.On the rear panel, all the analogue connectivity operates at 24-bit, 44.1kHz. This includes the unbalanced main outputs and both unbalanced and balanced (XLR) 'Sub Out' outputs. In a live context, the main outputs might be used to feed a guitar amp (or pair of guitar amps), while the Sub Outs could provide a direct feed to a mixer. Two send/return loops are provided for patching in external effects processors, and there are also plenty of options for adding foot or expression pedals to control the GT Pro during live performance (see the 'Pedal Power' box on page 136). The final key feature of the rear panel is the USB connector. 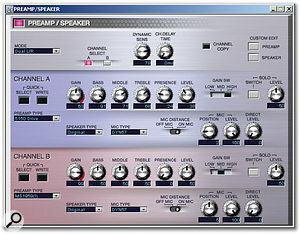 While the GT Pro package includes editor and librarian software for PC and Mac, the USB connection can also be used to pass audio signals to/from the unit and ASIO drivers provide support for 24-bit/44.1kHz recording via a suitable host on the computer system. The dual COSM amp-modelling engine provides simultaneous access to any two of the 46 amp models. These cover all the usual territory, from clean sounds based on a Roland JC200 through a host of classic Fender, Vox and Marshall-based models and into the higher-gain MESA Boogie, Soldano, Peavey and Hughes & Kettner arenas. The effects options are split into 44 categories and up to 15 effects blocks can be used at any one time. 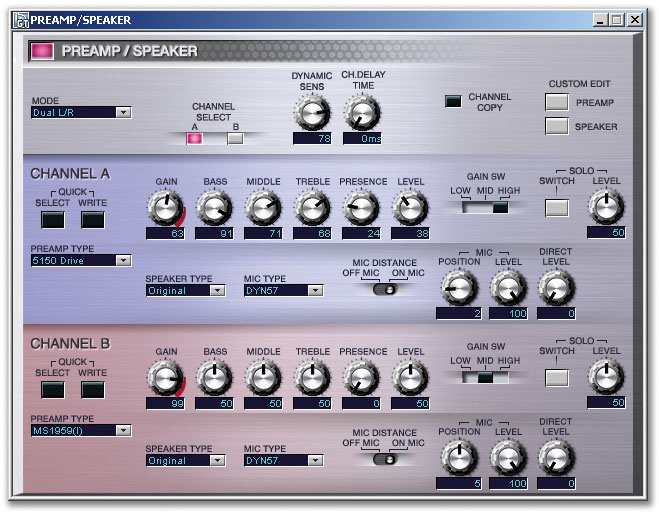 These categories include overdrive, distortion, compression, limiting, chorus, delay, reverb and wah, with the more unusual defretter, guitar simulator, sitar simulator and wave synth amongst the many others. Within each category, a number of further options are provided: for example, the overdrive/distortion category offers models of some 30 different pedal types. Combinations of these amp and effects models can be built into patches and, alongside the 200 preset patches, the unit can hold a further 200 user patches — enough for even the most demanding of tone tweakers. For live use, one of the Roland/Boss footpedal accessories would be essential with the GT Pro. These devices include simple expression pedals such as the EV5 and switches such as the FS5U or FS6, but the top of the range is the FC200. This offers 13 footswitches and an expression pedal and, via the dedicated FC200 'mode' available in the GT Pro, would provide an excellent companion for the processor, both in the studio and on stage. This would enable the switching of patches, expression-pedal control with effects such as volume or wah and the ability to turn effects on and off on the fly. That said, at £369 the FC200 is not cheap and, if you want a Boss foot controller unit purely for live use, the GT8 certainly provides the core of what you get with the GT Pro/FC200 combination, at a much more accessible price. As with other guitar amp/speaker/effects modellers, a patch consists of a particular combination of amp settings and speaker settings, plus whatever effects are required. Given the processing power provided by the GT Pro, things can get a little more complex, as each patch can have both A and B channels (rather like many traditional guitar amplifiers) and different amp and speaker combinations can be selected for each channel. Most sections in the main Editor window feature a Detail button that brings up further controls, as shown here for the Preamp/Speaker settings.The channels within a patch can operate in several modes; single, dual mono, dual L/R and dynamic. In single mode, only one channel is used, and therefore only one amp/speaker model. In dual mono the outputs of both channels are mixed, allowing you to blend the sound of two amp/speaker combinations together. However, the most interesting modes are the dual L/R and dynamic. In the former, the two channels are separated to the left and right outputs, so in a studio setting you might have a Fender Twin model coming out of your left monitor and a Marshall stack model coming out of the right. As you can also specify a delay of up to 50ms between the two channels, this can create some very convincing 'double-tracked' guitar sounds. In dynamic mode, channels A and B are switched depending on picking intensity. With suitable sounds programmed in both channels, this can provide some very creative options for changing the guitar sound on the basis of how hard you play. Dynamic control can also be used with some GT Pro effect types, most obviously with the touch wah. Given just how much the GT Pro has to offer, patch editing from the front panel is not an excessively complicated affair. In part, this is simply because of the many dedicated buttons on the front panel. However, guitarists can be a conservative lot when it comes to technology (although this probably doesn't apply to those that are regular SOS readers) and I could easily imagine potential purchasers being a little daunted during their initial encounter with the GT Pro. The GT Pro Librarian does its job in a neat and tidy fashion. Fortunately, as I mentioned earlier, for those with access to a suitable USB-equipped Mac or PC, the GT Pro ships with both editing and librarian software. 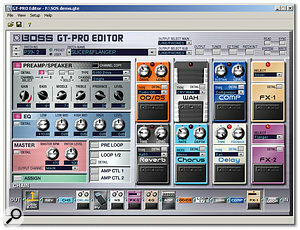 Inevitably, patch editing via a graphic interface on the computer is much more intuitive than via the GT Pro's own 16-character, two-line LCD. 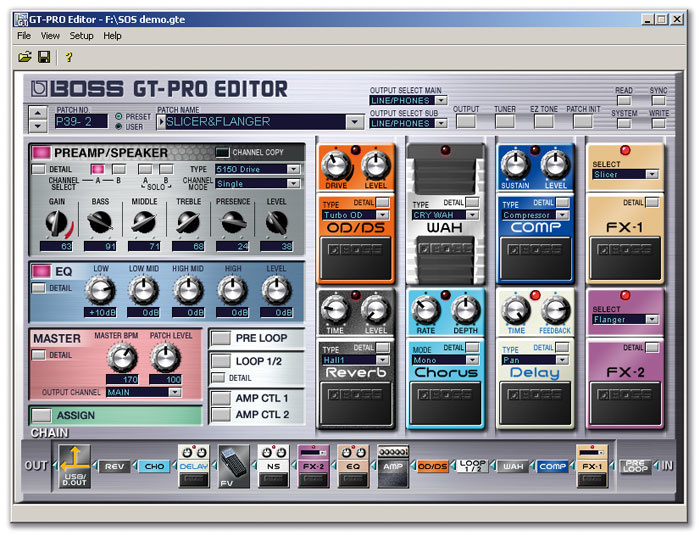 The GT Pro Editor also allows users to make easy adjustments to the effects signal chain by simply dragging and dropping the various effects blocks at the base of the window. The Librarian application does its job well enough, and the only thing that I would have liked to see is a closer link between the two applications. Of course, the other use of the USB connectivity is to get audio to and from the host computer. During my tests the ASIO drivers certainly seemed to behave themselves well enough for both recording and playback duties via Cubase SX. The SX Performance meter barely flickered while my computer played back a mix containing a couple of VST instruments and half a dozen stereo audio tracks while simultaneously recording a new stereo track via the GT Pro. The only odd behaviour I noticed was that VST intrument plug-ins seemed to take quite long time to load initially. Otherwise, the drivers performed well. While I'm not sure I'd want to use the GT Pro as my main audio interface (just as I don't rely on my own Pod XT for these duties), it would do a respectable job if you didn't require a phantom-powered microphone input. One advantage of recording guitar parts via the GT Pro, however, is that it is possible to specify where in the signal chain the USB output is taken. While you might usually take an output with amp modelling and effects applied, you can also choose to record the unprocessed signal while still monitoring the processed one. The unprocessed signal could then be fed back to the GT Pro and 're-amped', allowing you to adjust the guitar sound to best fit the final mix without having to re-record the performance. This re-amped sound can then be recorded back to the computer. PC: Windows 98 or better; 600MHz Pentium/Celeron or better; 256MB RAM recommended; 200MB hard disk space; USB port. Mac: Mac OS 8.6 or later, Power PC G3 600MHz or faster, 512MB RAM recommended, 200MB hard disk space, on-board USB port. Technical specifications aside, the GT Pro does sound very good, and those familiar with earlier Boss multi-effect guitar processors will find themselves in familiar sonic territory. The presets tend to be dominated by some big-sounding tones, often layered with a good dose of effects. While I'm sure the intention is to impress when the unit is being demo'd in a shop, the sounds are undeniably good. Particularly impressive are some of the dual L/R mode presets (for example, Fat Stereo Lead or Stereo Stack). If you need a single sound to fill a lot of space, these are just the job. Throughout, the quality of the Boss effects processing is up to its usual high standard: from overdrive to modulation, everything sounds very good and offers the user plenty of control. One or two of the more off-the-wall processes are perhaps less effective upon close studio examination (the acoustic guitar simulation, for example) but would work well enough in a live context, while some of the others — including the wonderful slicer — provide plenty of creative possibilities. A well-stocked rear panel includes unbalanced main outputs and both unbalanced and balanced (XLR) 'Sub Out' outputs. There are two send/return loops for connecting external effects processors, plus foot/expression pedal sockets. Finally, there's a USB port for direct connection to a computer.Photo: Mike CameronA good number of the presets are aimed at various styles of rock, but there are some nice clean and special effects patches too. However, as with all units of this type, it's always worth digging beneath the effects and listening to the basic amp and speaker modelling. The GT Pro has nothing to hide here, as it is very capable of producing a wide range of basic guitar-amp sounds without the fairy dust provided by the effects. From glassy, clean tones through to absolutely saturated hi-gain, pretty much everything is provided, and mixing and matching between the various amp models and the different speaker-cabinet types produces even greater variety. Guitar tones are, of course, very much a matter of personal taste and I found myself consistently comparing the sounds of the GT Pro with those of my own Line 6 Pod XT. While the differences were undoubtedly subtle and any such comparison is always going to be subjective, even in terms of the basic amp/cabinet modelling I felt that the GT Pro created a somewhat more 'produced' sound, while the Pod XT was somehow a little more 'raw'. There is a place for both of these approaches and I'm sure individual players, with their own playing styles and musical needs, would have their own preferences when auditioning the GT Pro alongside their current amp-modelling weapon of choice. All that said, I'd be more than happy to find a GT Pro in my own rack. From a technical and sonic perspective, this is a very professional piece of equipment. Given its price — and its high technical specification — the GT Pro may appear a little daunting to the amp/speaker modelling newbie and they may prefer to check out the lower-priced, floor-mounted Boss GT8, alongside competing products from the likes of Zoom and Line 6. However, the GT Pro is capable of producing almost any guitar tone you care to think of — plus a whole lot more besides — and I can certainly see it appealing to professional and semi-professional gigging/studio guitarists who need a wide sonic palette for their work. Huge number of processing options in a relatively small space. The dual L/R amp mode is great for a really big stereo sound. A little pricey for some? Front-panel editing may be a little daunting for some at first. For the professional guitarist, the GT Pro offers a tremendous range of convincing guitar tones in a single box.